If you’ve been visiting our website for long you know that Top Gun has had a lot to do with improving ride quality at the rear end of the KLR650 (all years). When I purchased my first KLR (an ’89) in early 1990 it took only one ride in Baja to convince me the back end was woefully over-dampened and at the same time greatly under-sprung. I contacted Stig Pettersson at Pettersson Pro Suspension then located in LA. Since Stig had been a top-ten European motocross racer and later a factory Ohlin’s race team suspension tuner, I figured he was my guy, and I was right! Stig built me the first one-off remote reservoir Ohlin’s shock ever installed on a KLR650, and it transformed the ride. It took Stig and me a while to reach the correct spring rate for my bike and load. Starting at the factory 5.05kg spring we finally settled on 6.6kg which is perfect for my body weight of approximately 200 pounds plus 35 pounds of soft bagged stuff at the rear. When my wife Pauline Read talked me into becoming my KLR650 co-rider in 1993, the spring rate testing began anew and only ended in this century when Jerry Wohlgemuth at Ohlin’s suggested we go to a 9kg spring. Bingo!! With the 9kg spring and 22mm of preload the ride height is nearly perfect for our gross load of approximately 775 pounds. Without going into detail, the KLR-A’s front suspension was also greatly improved with the help of “Stig” (at PPS), Mike Henderson (then a top spring R&D guy) at Progressive and among other things some careful anodizing and honing of the lower fork tubes. In short, my KLR650-A has by far the most efficient and most comfortable suspension I’ve ever had on a motorcycle since I began riding over a million miles ago in 1955. It turns out that all the work that went into developing the suspension of the KLKR650 was not just for me and my co-rider. Top Gun now has high quality rear springs for KLR’s of all years (1987 – present). The three spring rates should cover just about any load a KLR may carry and they are manufactured of the highest quality material and custom made to properly fit the stock dampener. Now, you ask, what does all this long winded stuff have to do with my DR650SE? Well, of the more than 500,000 miles I’ve logged since 1990 on DR350’s, KLR650’s and DR650’s, approximately 140,000 miles have been on DR650SE’s. The development time for the DR650 was much shorter than for the KLR due to my KLR650 experience. I simply “dialed” the front forks into PPS specs and had Mr. Pettersson build me two custom Ohlins’s gas shocks, also to myspecs as to open, close and dampening settings. Pauline’s two-up shock got a 9kg spring (thank you again Mr. Wohlgemuth) and my solo shock is fitted with a 6.5kg unit set to carry my 200 pounds. If you weigh over 200 pounds and carry gear, it’s time to remove the stock spring and replace it with the new Top Gun unit. By the way, Rod Morris at MMP can provide you the part and detailed information (click here). After reassembling the spring support parts you’ll have to set your pre-load and ride height. 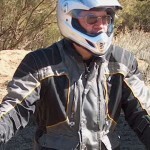 This is a trial and error procedure but you’ll know you’ve “got it right when one third of your total travel is used up” with you and your gear in place on the motorcycle.